Also called the Judas tree, the redbud (Cercis canadensis) is native to the eastern United States. 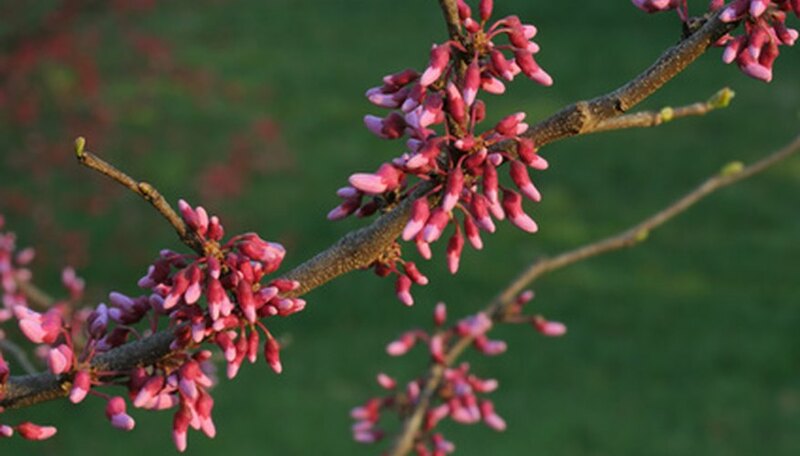 Its namesake red buds open to rosy pink blossoms that bloom in early spring and persist for two to three weeks. Cultivars exist with white, rose-purple or double pink flowers. Redbud grows 20 to 30 feet high. It will spread 25 to 35 feet at maturity, although redbud trees tend to live only about 20 years. Plant redbud trees that were grown locally from locally produced seeds. Redbuds are very geo-centric. Seedling trees grown in a different geographic location from their parents will struggle and usually do not survive. Although it will tolerate light shade, plant the redbud tree in full sun for the greatest number of flowers. Choose a site with moist but well-drained soil. It cannot tolerate permanently wet soils, but the plant does tolerate soils that are high or low on the pH scale. Plant redbuds when they are fairly young. Their shallow root systems do not survive transplanting once established, and older transplanted trees seldom survive. Redbud has a natural tendency to grow as a many-stemmed bush-like tree. When it is very young, prune off all but the strongest of these to create a central leader. Other than this crucial pruning, redbud trees only need to be pruned to remove dead, diseased or crossing branches. Although they are drought tolerant once established, redbud trees need supplemental irrigation when young. Provide young trees with the equivalent of an inch of moisture per week for its first year or two after transplanting. Mature trees will also benefit from artificial irrigation during times of drought. Fertilize redbud trees yearly in late spring, after their flowers drop. This will help keep the tree healthy, as it is susceptible to a host of pests and diseases which are the primary causes of its short life span. Apply a balanced, all-purpose granulated fertilizer to the area beneath the drip line, following the manufacturer's recommendations.